This no bake strawberry cheesecake is extra creamy and bursting with strawberries. It’s a super easy to make and turns out with a luscious texture, crunchy graham cracker crust, and delicious strawberry flavor that no one can resist! 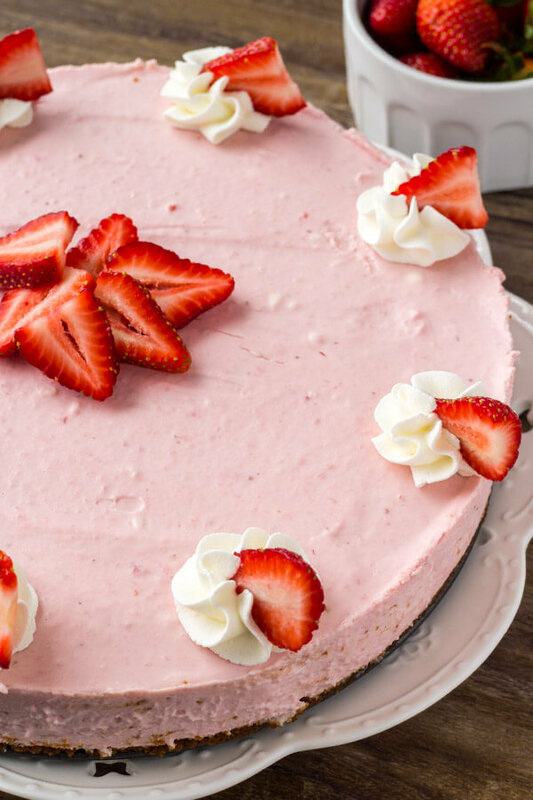 This no bake strawberry cheesecake just might be the perfect cheesecake for spring and summer. It’s creamy, smooth, filled with real strawberries, and you don’t even need to turn on the oven. 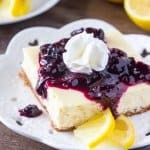 And it’s a delicious recipe for Mother’s Day, summer potlucks, or whenever you’re looking for an easy, delicious cheesecake recipe. 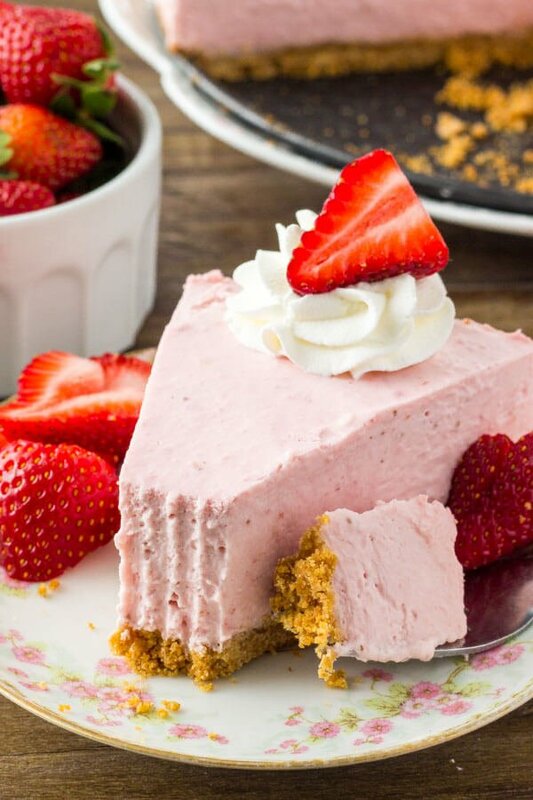 This strawberry no bake cheesecake is super easy to make. If you just want to get straight to the recipe, click here . But I wanted to go into some detail and give you ALL my tricks (aka method to my madness). First we make the graham cracker crust by mixing together graham crumbs, a little sugar and melted butter. Then press it into the bottom of a 9 inch springform pan. If you like a crunchy crust, you can bake it in the oven at 350F for 10 minutes, but this isn’t necessary. For the strawberry flavor, we’re using real strawberries. First puree the strawberries in a blender or food processor. Then push the puree through a sieve to remove the seeds. This isn’t 100% necessary, but I prefer not having seeds in the cheesecake. Then boil up the strawberries with some sugar, and mix in gelatin. Allow the strawberry mixture to cool fully, then get on with the cheesecake. And the strawberry sauce that we made. First we beat the whipping cream until stiff peaks form. 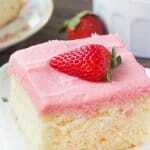 Then beat together the cream cheese and powdered sugar, and mix in the lemon juice and strawberry sauce. Finally, fold in the cream that you whipped. 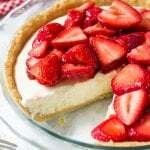 Spoon the strawberry cheesecake over the graham cracker crust, then place in the fridge to set. 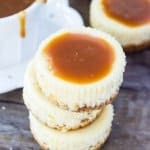 You can speed up the process by placing the cheesecake in the freezer too. 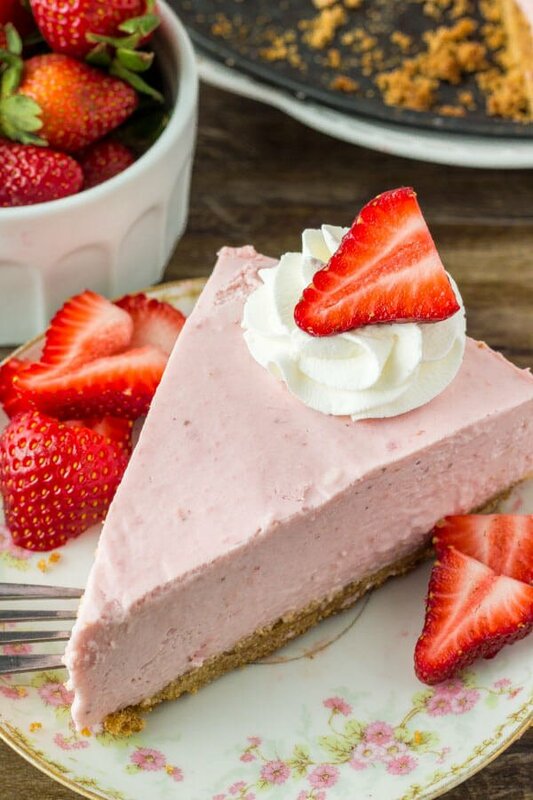 Now – some common questions I get asked about how to make this no bake strawberry cheesecake. Can I use a 10 inch springform or 8 inch springform? Yes, it’ll just be a bit thinner in the 10 inch, or a bit thicker in the 8 inch. Can I use frozen berries? Frozen strawberries are fine, but you’ll want to boil them for a bit longer to remove the extra liquid from freezing. Do I have to use gelatin? Yes. 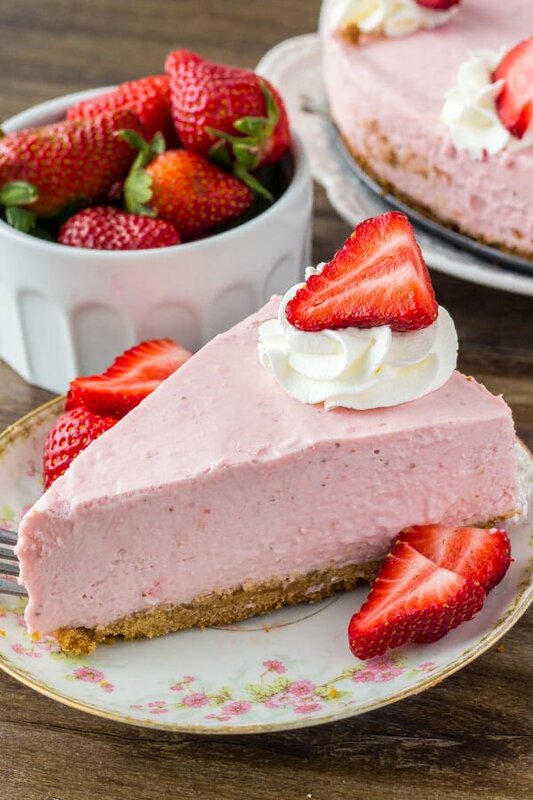 I tried making this strawberry cheesecake without gelatin, but I really couldn’t get it to set and stay firm without it since the strawberries add so much extra liquid. If you want to make no bake cheesecake without gelatin – I’d try this no bake peanut butter cheesecake, or these no bake cheesecake squares. Can I freeze it? Absolutely. I found this cheesecake froze really well. Then just thaw in the fridge for a few hours before serving. 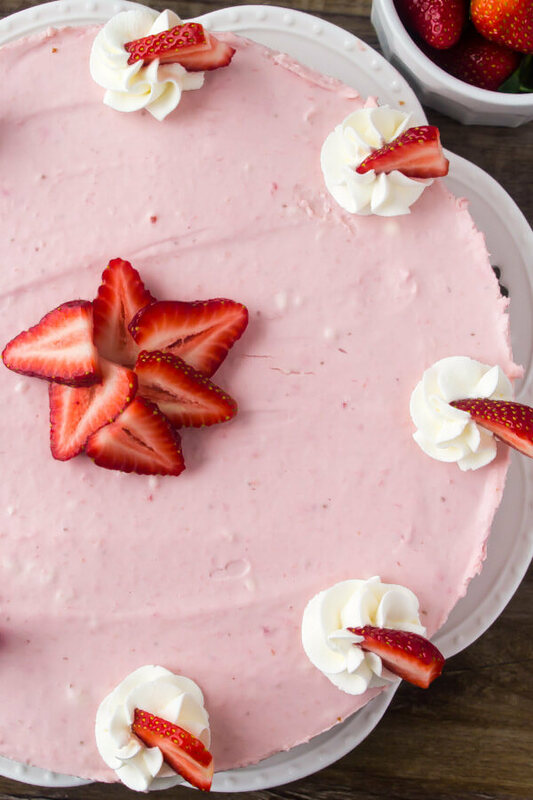 This no bake strawberry cheesecake is so creamy without being too dense, bursting with real strawberry flavor, and honestly reminds me of a big strawberry milkshake (which I think is a very good thing). It’s so easy, and perfect for spring or summer – and I definitely don’t think you can go wrong with strawberry cheesecake. This no bake strawberry cheesecake is extra creamy and bursting with strawberries. It's a super easy to make and turns out with a luscious texture, crunchy graham cracker crust, and delicious strawberry flavor that no one can resist! Press into the bottom of the prepared pan to form the crust. Place in the freezer. Push the puree through a sieve to remove the seeds. (Optional, but recommended). Add the puree to a medium sauce pan with the sugar and bring to a gentle boil while stirring. In a small cup moisten the gelatin with 2 tablespoons water. The the gelatin to the strawberry mixture and boil while whisking for 5 minutes. Remove from the heat and cool. In a large bowl beat the whipping cream until stiff peaks form. Mix in the cooled strawberry sauce and lemon juice. Gently fold in the whipped cream until the mixture is even. Spoon the mixture on top of the crust, smooth the top, and place in the fridge to set for 4 hours, or in the freezer for 1 hour. **Cheesecake and be frozen and then thawed in the fridge. Hi Fiona, just wanted to know how many tablespoons of gelatin is required for this recipe. About 2 1/2 teaspoons of gelatin are in one packet. I would like to use frozen strawberries. Do I need to reduce an6 liquid or just keep in the same. Thanks!